No doubt you’ve heard about the Nobel prize, but did you know that Alfred Nobel was a Swede and that the Nobel prizes (with the exception of the Peace prize) are awarded in Stockholm every December? 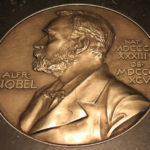 I did find out a lot about Alfred Nobel and his namesake prizes during my small group pre-TBEX tour entitled “In the footsteps of Alfred Nobel”. However, the main reason I picked this tour among several dozen others was the food. 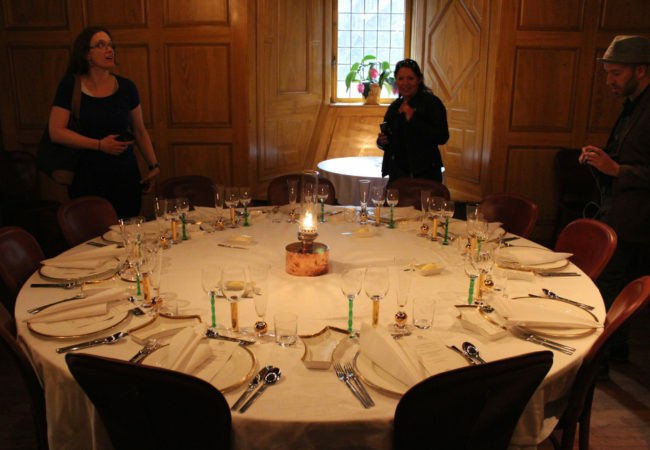 The tour was to end with the complete 2015 Nobel dinner, served on the original Nobel China. 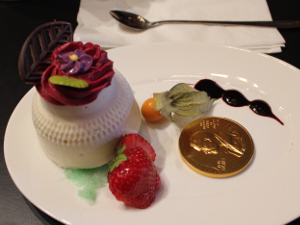 How often do you get to eat like a Nobel prize laureate? Since this was a private tour designed for 10 lucky participants from the TBEX conference (on a first-come first-serve basis) you can’t just go to Stockholm and sign up for it. However, every attraction I describe below is open to the public, even the possibility of eating a Nobel dinner, so read on. 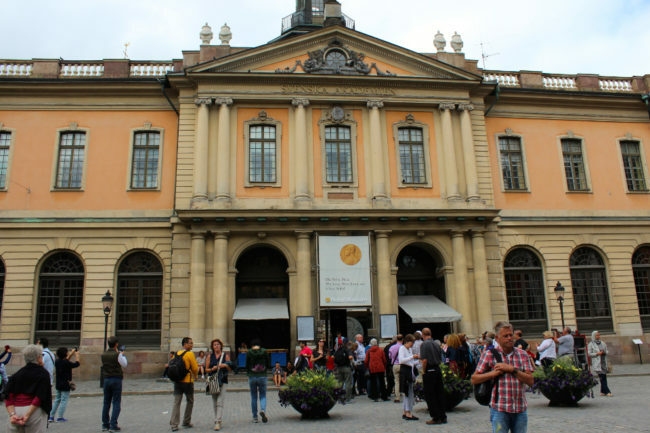 The first stop on the tour was the Nobel Museum, located on Stortorget, the main square in Gamla Stan (Old Town). The full admission fee is 100 SEK (US$12), but it’s also included on the Stockholm Pass. They offer guided tours in English every day (included in the fee). This is where you get to learn everything you may want to know about Alfred Nobel, the Nobel Prize, and the Nobel Laureates. The museum also has a café where you can savour the Nobel ice cream, perfect for a fika! Alfred Nobel (1833-1896) was a Swedish chemist, engineer, innovator, and armament manufacturer. He held a total of 355 patents, with dynamite being his most famous invention, and amassed a large fortune. It is not precisely known what led him to create the Nobel prize. Many believe that a premature obituary accusing him of being a “merchant of death” for manufacturing weapons could be the reason. It is also possible that he was trying to make amends for the death of his younger brother in a dynamite experiment gone wrong. There are six Nobel Prizes: Physics, Chemistry, Medicine, Literature, Economic Sciences, and of course the Peace Prize. Economic Sciences was not listed in Nobel’s testament but was added in 1969 in a collaboration between the Nobel Foundation and the Sweden Central Bank. 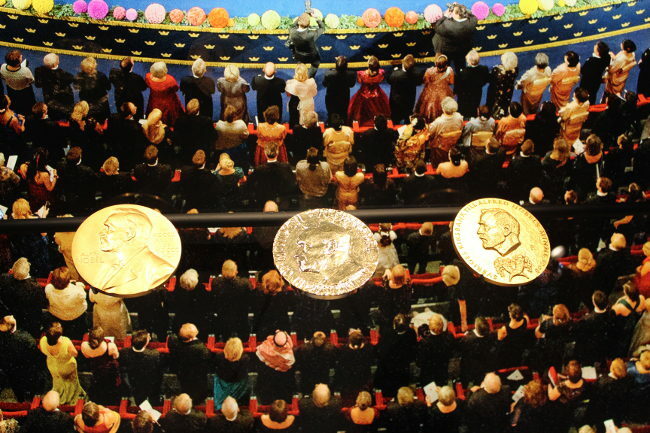 The five other prizes have been awarded every year on the anniversary of Nobel’s death (December 10) since 1901. 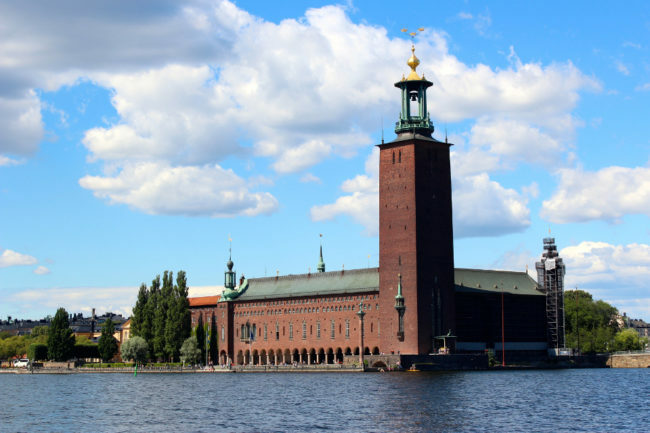 Except for the Peace Prize, which is presented in Oslo (Norway), the other prizes are bestowed in Stockholm during a ceremony at the Concert Hall (near the Hötorget metro station). City Hall can be visited by guided tour only. Public tours cost 70 to 100 SEK (about US$8-12), depending on the season. Our group was given a private tour after hours, so we had the whole place to ourselves. 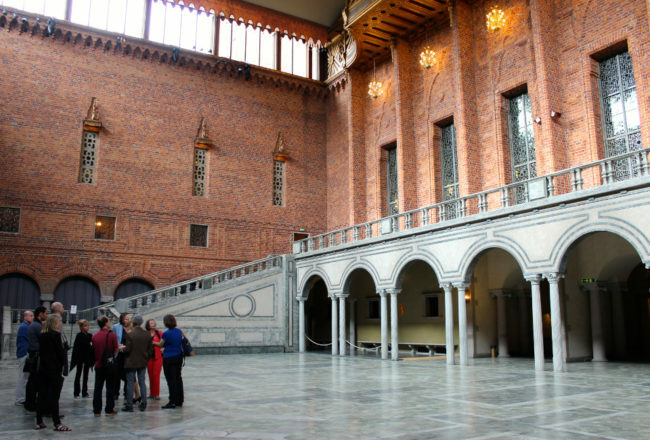 Our guide first showed us the so-called “Blue Hall” which hosts the Nobel banquet and its 1350 guests. At 1500 square metres and 22 metres high, it’s a massive room. It’s not blue though. The name came from the original plans that would have had the red brick walls plastered and painted blue to resemble the water of the bay, but the architect later changed his mind. I thought the hall had a vaguely Moorish appearance. We visited the Council Chambers, then a long gallery decorated with a fresco painting by Prince Eugen called The City on the Water depicting the view that you can see through the windows on the opposite wall! 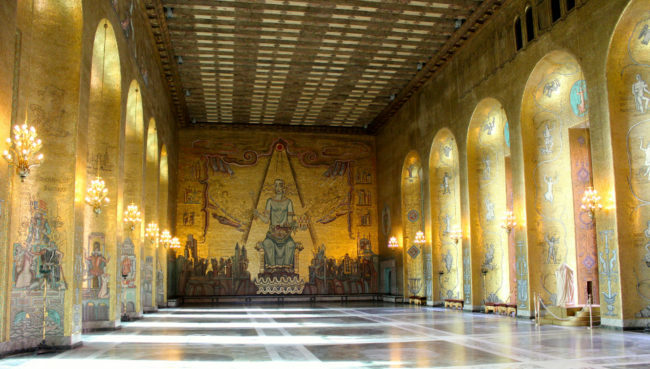 Finally, we came to the most impressive room of all, the Golden Hall, covered in more than 18 million pieces of gold leaf mosaics depicting scenes from Stockholm’s history. This is where the post-Nobel banquet dancing and festivities take place. My photos don’t do justice to this dazzling room. The tour ended with a climb up the 106-metre tower, partly by elevator, and partly along steps followed by a narrow spiralling pathway. At the top you can admire the city and the shimmering waters sprawling below you in all directions. By that point we had all built up an appetite and were eagerly anticipating the highlight of the tour: the Nobel dinner. We exited City Hall and then re-entered through a separate side door that led to a basement restaurant, the Stadshuskällaren. While the regular menu here is not outrageously expensive, the Nobel dinner is a different story. After taking a thousand pictures (we’re bloggers after all) the ten of us sat down at the round table in the small intimate room and prepared ourselves for a feast. The numbered menu (a keepsake) showed three courses, each with a matching wine. As expected, everything was delicious, from the bread to the digestif. If you’re curious, you can find out the Nobel menus for every year since 1901. Ours was 2015. 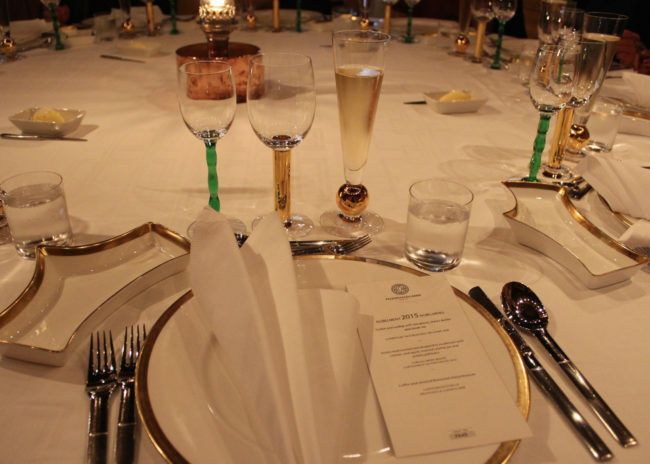 The meal was served in the original china and glassware from the Nobel banquet, both designed and manufactured in Sweden. The glasses are from Orrefors and the china from Rörstrand. With each set worth around 5000 SDK (about US$600), needless to say we were very careful toasting our good fortune! I am very grateful to Visit Stockholm for sponsoring this activity, as the full price for the 2015 Nobel dinner is a gasp-inducing 1695 SDK (US$200). It could be worth it for a splurge though, or if you want to surprise your partner for a special anniversary perhaps. In fact, if you have a group of more than 10 people, you can pre-order the Nobel menu from any year, but it might cost you even more (depending on the availability of the ingredients I suppose). About to dig into the main course! Want to win a nobel prize? I have Swedish ancestry and would love to go there someday. Your trip looks absolutely awesome. Nice photos and descriptions. Great post, Marie! 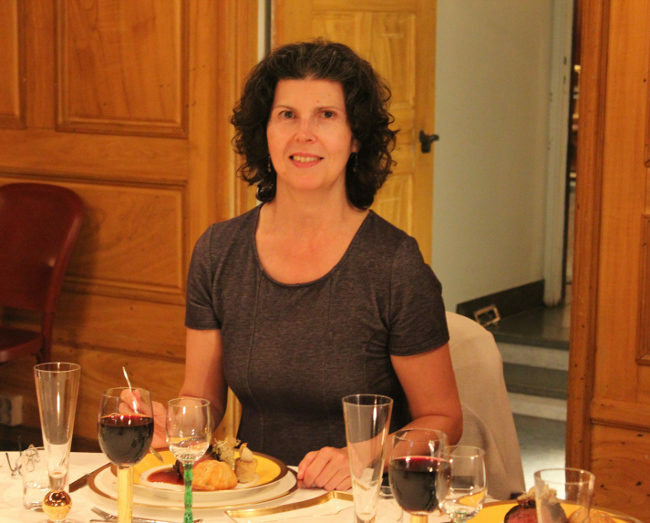 The Nobel Dinner was definitely the highlight of our trip to Stockholm. Aside from the food (which was amazing! ), I loved the photography exhibit with playful Nobel Prize winners explaining their discoveries at the Nobel Museum. I also loved the tradition of having Nobel Prize winners sign the bottoms of the chairs in the cafe at the museum. Hi Jennifer! Thanks for dropping by. The chairs is something I forgot to mention, or rather omitted because my post was getting rather long. King Carl Gustaf and Queen Silvia of Sweden hosted the traditional dinner for this year’s Nobel Laureates at the Royal Palace of Stockholm on December 11, 2015 in Stockholm, Sweden.